Back in January, for about 2 weeks I had the reoccurring feeling of a lump, like I had swallowed a large pill, in the back of my throat. It would get better and worse and change with different positions. As a mom, of a then 4-month-old and a 3-year-old, I was a little surprised to find myself making a doctor’s appointment. With young kids, and just coming out of intense prenatal care, most mom’s know that if your arm isn’t falling off you don’t make time to see the doctor. My doctor performed a physical exam and found nothing, she suspected reflux, but I told her that I had a family history of thyroid cancer. My doctor suggested we do an ultrasound to just rule out any physiological abnormalities. That ultrasound showed a large mass on my right thyorid. This of course was not the news that I wanted to hear. The next step was a biopsy that came back benign, and a follow up ultrasound. I met with the surgeon as the mass showed slight but definite growth. He said that I could wait until my baby was a year since it may interfere with breastfeeding. If you have been following me or reading my posts for any length of time you know that this is not my typical post, but as I’ve shared my story with others, I have found so many with similar stories. I am writing this to encourage and help others who may have this journey in their future. Now, my outcome in no way is reflective of what your outcome could or will be, but I think there are a few unknowns that I had, that may help others navigating this journey. This was probably the biggest unknown for me, and truthfully one of my biggest concerns. At this point, I hadn’t been away from my baby for more than about 6 hours at a time since he was an infant. I had stopped supplementing with bottles, since he was eating real food so well. When I met with the surgeon he said to expect that I will likely not be able to nurse for 24-hours, and warned that there is a chance with any surgery that my milk supply could dry up all-together. When I arrived for my surgery, my doctor advised me that as soon as I felt “normal,” I could return to breastfeeding. I am the type of person that doesn’t tolerate NyQuil so I was prepared for the worst. The type of anesthetic that my doctor used didn’t make me loopy or really even drowsy. I had my surgery in the morning at 7:30 am, so I nursed my baby before I left for the hospital and then was able to nurse him again when I was upright later that afternoon. My pain was very minimal, in fact I didn’t take any pain meds. I don’t share this to say how amazingly tough I am, but to show that my doctor was right. Back when I had the breastfeeding discussion with my doctor he had told me that I would likely be able to stick with over-the-counter breastfeeding-safe medications like Tylenol to manage my pain. When he told me this I didn’t believe him, but it turns out his 20+ years of surgical experience were far more reliable than my fear of pain. I think the stiffness was probably more pronouced than the pain. Probably my worst symptom came from my unability to swallow. During the prodcedure my uvula (you know, that little thing that hangs down in the back of your throat), got nicked. In the process of healing it swelled up and made swallowing and carrying on a conversation very difficult. As a dietitian, I definitely know about the swallowing process, but I got to experience it firsthand. From a dietary standpoint, I learned that there are very few nourishing and satisfying foods that are easy to swallow. Sure, pudding, ice cream, and beverages are great for a few meals, but I got a little burned out, and in general wanted something savory. There are also few quick options. Several times I opened my pantry or fridge scanning for something to put in my mouth and ended up back on the couch before I could find anything. A dietitian’s firsthand experience with dysphagia. Just for fun, I wanted to share a few of my favorite post-surgery eats. On day 1, I ate pizza! It’s a little crazy to think that, but my throat had not swollen yet, and truthfully I only ate about half of a slice. By day 2 I tried to eat it again and couldn’t swallow it. To fill in the gaps I ate some pudding, ice cream, and drank a lot of water. Two convenience foods that I found I could surprisingly tolerate well were peanut butter M&M’s and graham crackers. 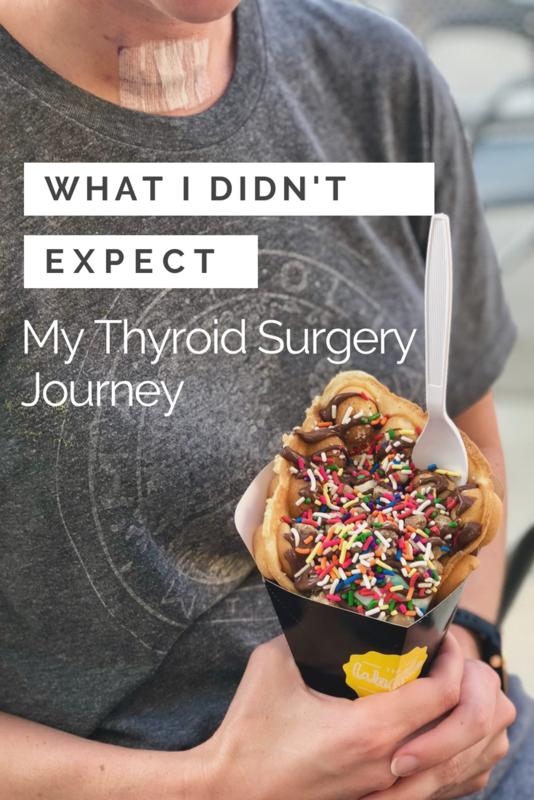 As I got a little better later in the week, it wasn’t as much that I couldn’t swallow a larger variety of foods, but when I tried to eat my normal portion of most foods my swallowing became fatigued. I am writing this 7 days post-op and still struggling with some swallowing difficulties. My pathology came back benign, but the mass they pulled was almost 5 cm. I am still on the road to recovery. Have you been through something similar, or know someone who has? I’d love to hear your experiences.